Unfortunately everlasting changes are taking place in mobile apps, which satisfies needs of fundraising business successfully. Right away, many users are focusing on mobile applications due to its simple navigation, high functionality and better performance. This mobile app offers a simple way for fundraisers to enhance their Crowdfunding business growth seamlessly. 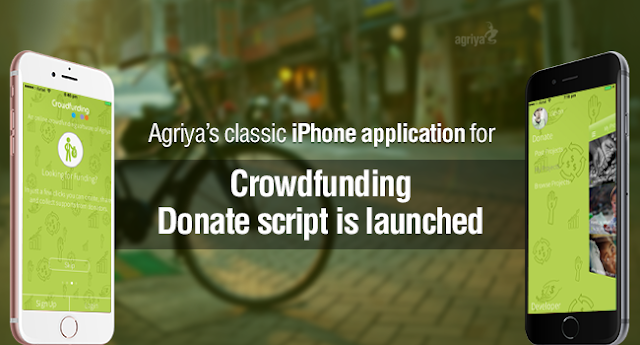 Considering this, Agriya has released its interactive iPhone app for our cutting-edge Crowdfunding donate script. This iPhone app makes it very simple for fundraisers to run and manage their fundraising campaign directly from their mobile device. Within few taps, entrepreneurs can apply their innovative thoughts to gratify all your Crowdfunding business needs by utilizing this stunning iPhone application. This Crowdfunding donate iPhone app software is integrated with user-friendly interface, attractive responsive designs, simple navigation, turnkey solutions and advanced features, which enable entrepreneurs to make a huge success record in fundraising platform within a short period. It ensures solid experience in raising money and huge investment easily with spamming excitement quickly. With help of this iPhone App entrepreneurs can grab more business dealings rather than a desktop. This app will be a perfect match for startups and it enables you to acquire immense growth in the fundraising industry. Within few taps users can easily list their projects on the website by using this interactive iPhone app. Donors can donate the money to these projects if they feel projects are valuable. Webmaster can earn some commission fee for every donation access made on the website. Further, this iphone app is configured with revenue options to earn more profit. iPhone application is configured with sophisticated technology, high quality tools and ensues better performance. Let us see some prominent factors of iPhone app. It is an effective and robust crash reporting system that allows you to find the issues quickly and takes less time in fixing bugs. A unique thing about this system is to ensure best performance in finding issues during real-time. In order to enhance your mobile base you have to know who is using your apps right now on what devices and its locality. This tool assists you to identify significant areas to achieve huge success in a niche market. The ADMOB plugin is integrated with a mobile app to retrieve and display ads on Google mobile advertising module with iOS applications. On the listing page of our app you can view those ads. Good reviews and positive feedback acts as a fundamental element in achieving huge success in niche market. The iRate module enables the users to rate your iPhone application after using it for a while. Entrepreneurs can make use of this interactive iPhone application to establish your own Crowdfunding business in their phones with less effort. This iPhone App enables you to make a great revolution in the fundraising industry quickly.